Artificial scarcity is best explained I think as not getting access to the things that you need which is already produced. This is something that all monetary systems got as a fundamental flaw regardless if you have a government or not. It creates destructive behavior among people such as competition, aggression, greed, jealousy, theft, poverty, class stratification, murder among other things. What I have come to see the past few years is that people and capitalists in particular are mostly in denial of this because of their long held belief and dogma that capitalism is the best economic system there could ever be without actually looking at it’s structural flaws. Socialism and communism got the same flaws and I am certainly not supporting these kind of economic systems because a redistribution of wealth under the threat of violence will not create a moral society. 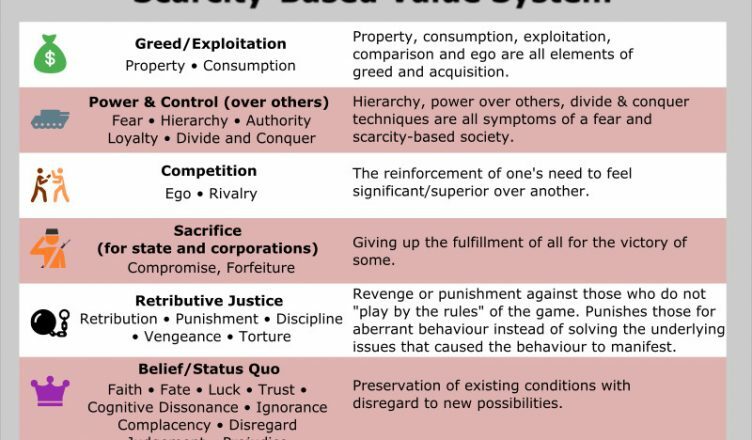 All three economic systems promotes artificial scarcity because there is no profit in making things less profitable and sustainable, that is why we for example get things like planned obsolescence and consumerism. So what I am suggesting is that people need to start thinking beyond the concept of money and government and think along the lines of open source and decentralization of all aspects of human society. Open source as a concept can and are already applied to many areas today which is all about collaboration where everyone can freely participate in the process and it’s entirely decentralized. About 50% of the worlds servers that are running is having Linux as an operating system which is open source. We also have android mobile phones which is open source. Invention, journalism, production, programming, education is already made open source and there is probably many more examples of this. These are good and informative presentations of various things that promotes a higher and more holistic level of thought that includes the idea of open source among other things. Three Questions: What do you propose?